New Panthers signing Emil Grondal flanked by team bosses Ged Rathbone (left) and Trevor Sawiles. Peterborough Panthers have made their second signing of the week...and this one has been given the green light by the sport’s governing body. The city club had a move for Swedish ace Jacob Thorssell blocked by the British Speedway Promoters’ Association (BSPA) on Tuesday (June 30). But a subsequent swoop for World Under 21 finalist Emil Grondal has received the thumbs-up from the authorities. 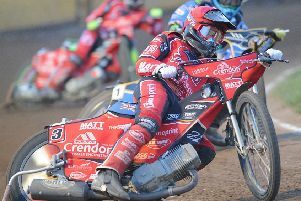 The highly-rated Danish rider arrives on an assessed seven-point average and will make his debut tomorrow (July 5) when Panthers entertain strugglers Redcar at the East of England Showground (4pm). Promoter Ged Rathbone said: “Emil was desperate to become a Peterborough rider and I’m delighted to give him the opportunity. “He travelled over to watch a meeting earlier this season and returned with his equipment to have a practice at the Showground. “He is held in very high regard back in Denmark and I know of at least three other Premier League clubs who were very keen to sign him. Panthers duo Ulrich Ostergaard and Michael Palm Toft missed out of a place in the Premier League Pairs final by the narrowest of margins last night (July 3). They were pipped by Brady Kurtz and Josh Grajczonek of host club Somerset in a semi-final showdown at the Oak Tree Arena. Panthers had earlier qualified from Group A with a race to spare along with eventual winners Ipswich. They slammed in 7-2 maximums against Rye House and Newcastle before edging out Edingburgh 5-4 by packing the minor places. They were pipped 5-4 by Ipswich due to a Palm Toft retirement to miss out on top spot in the group and their hopes of ending the club’s silverware drought came to an end in the semi as Palm Toft just failed to reel in Somerset man Grajczonek. Teen talent Robert Lambert lines up as one of two track reserves at the British SGP at the Millennium Stadium in Cardiff today (July 4).